The truth on a tea towel . . . I grew up with this picture in some ways as it was in 'The Family Of Man' exhibition catalogue which was in my parent's home and my maternal grandparent's too. This book was a profound influence upon me and shaped much of what I found fine in art photography and introduced me to the world's greatest photographers and a life long obsession. The Welsh poet, Dylan Thomas, wrote those words in 1951. A few years earlier, on 19th April 1943, Jewish Poles in the Warsaw Ghetto lived them. 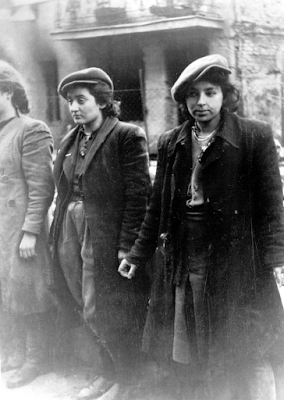 On the eve of the third Passover of the Second World War, women and men of the 'Jewish Fighting Organisation' (ZOB) in the Warsaw Ghetto launched an armed uprising against their Nazi persecutors. Of more than 400,000 Jewish Poles who had been thrown into the Ghetto by the fascists since 1940, hardly any remained by the Spring of 1943. Most had been deported into the Nazi death camp system, never to return. The last few left in the Polish capital knew that the final liquidation of the Ghetto was imminent – they rallied together behind the principle that "dying with arms is more beautiful than without." If the SS wanted to finish them off, the Ghetto would not make it easy for them. Lengthy preparations for a major armed resistance were made: bunkers were dug under buildings, firearms and Molotov cocktails were distributed, the sewer system was mapped out as a way of getting around invisible to the Nazis. Requests were sent to the non-Jewish national resistance – which was sadly quite heavily influenced by antisemitism itself – for arms and support, but the Ghetto received nothing significant. All this planning was helped by the fact that most of the Jewish insurgents were young Leftists with experience of group organisation. There were Communists, Socialists, Marxist-Zionists, anti-Zionist Bundists, and some with experience of the Spanish Civil War – a true rainbow of anti-fascism. The fight kicked off 75 years ago today, when 3,000 SS and Wehrmacht soldiers moved in to seize the remaining inhabitants. They wouldn't forget the welcome they received. Machine-gun fire and grenades rained down on the SS troops from windows and rooftops – Hitler's finest were sent running from the Ghetto by a few small squads of starving Jewish fighters. What followed was a brutal campaign of urban destruction. Too afraid to face the rebels in a straight fight again, the Germans simply burned them out, block-by-block, street-by-street, building-by-building. Nevertheless, the Ghetto fought on – hopelessly outnumbered and without resupply – for 29 days. 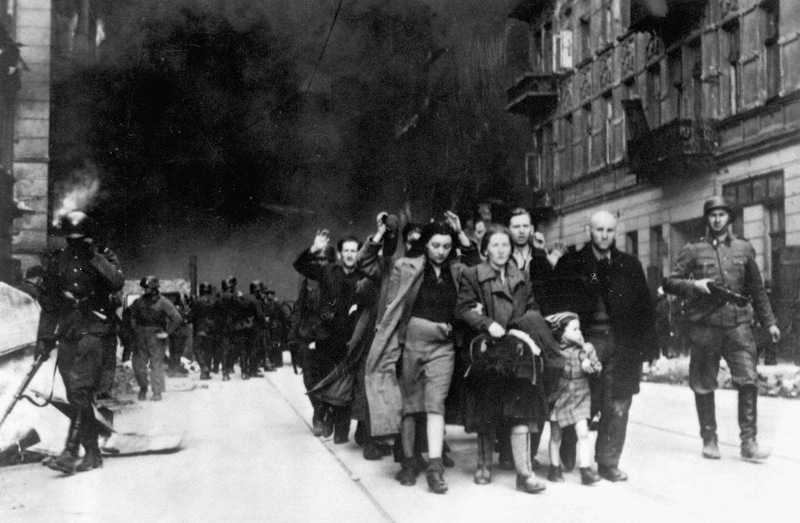 As a feat of armed resistance, the Warsaw Ghetto Rising is without equal in modern history. It also had a decidedly left-wing flavour. After two weeks of fighting, for example, the Jewish rebels made the time to commemorate May Day. German soldiers reported hearing verses of 'The Internationale' through the smoke and dust, soon to be followed by more Jewish rifle fire. The Ghetto Uprising highlights a really important part of the Jewish experience of the Second World War: Jews, when faced with Nazi racism, did not "go gentle into that good night." While vital pieces of reflection, creative works like Schindler's List and Martin Niemoller's 'First They Came for the Jews' poem may leave us with the impression that Hitler's victims faced their fate with dignity, but also with passivity. In countless cases this was not true. Across Europe, when faced with extermination, Jews took a stand, dug in, and opened fire. It happened in Warsaw, it happened in the Allied armies (Zygmunt Bauman, for example, served in the Red Army after escaping Poland), it happened everywhere. As Marek Edelman – one of the heroes of the Ghetto Uprising – said, "one should die with a bang." Nazi photograph of armed members of the ŻOB, the Polish Jewish anti-fascist armed resistance in the Warsaw Ghetto, captured during the Warsaw Ghetto Uprising. Amazingly, the woman on the right, Malka Zdrojewicz, was not shot on the spot and survived being sent to the Majdanek extermination camp.